Featured on the History Channel’s hit show Road Hauks, the custom-built Bootlegger vehicle will make its first ever appearance at the SEMA Show in ODYSSEY® battery booth no. 24875 at this year’s show. 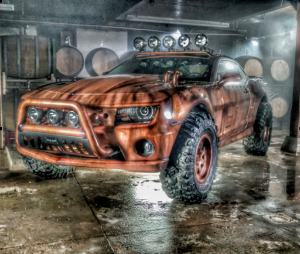 Featured on the History Channel’s hit show Road Hauks, the Bootlegger combines a 2010 CamaroSS with a custom off-road suspension to create an authentic “shine runner” vehicle for a local distillery. Lead designer Kenny Hauk and his crew stripped the vehicle completely and rebuilt it to include a custom lift kit with 35” tires, an all-wheel drive system, a copper-looking exterior, a cargo hold for moonshine, a roof-mounted LED rack and a real-life smoke screen. The appearance of the Bootlegger in the ODYSSEY® battery booth will be its first ever at the SEMA Show. The vehicle first appeared on Road Hauks on April 15, 2017. EnerSys®, the global leader in stored energy solutions for industrial applications, manufactures and distributes reserve power and motive power batteries, battery chargers, power equipment, battery accessories and outdoor equipment enclosure solutions to customers worldwide. Motive power batteries and chargers are utilized in electric forklift trucks and other commercial electric-powered vehicles. Reserve power batteries are used in the telecommunication and utility industries, uninterruptible power supplies, and numerous applications requiring stored energy solutions including medical, aerospace and defense systems. Outdoor equipment enclosure products are utilized in the telecommunication, cable, utility, transportation industries and by government and defense customers. The company also provides aftermarket and customer support services to its customers from over 100 countries through its sales and manufacturing locations around the world. Kenny Hauk, lead designer of Hauk Designs, works with his crew of expert mechanics and fabricators to build ultra-powerful, one-of-a-kind vehicles that look amazing and can go anywhere. Taking inspiration from iconic styles and designs throughout American history, these beautiful machines transform America’s rich past into modern, drivable, show-stopping creations. Road Hauks airs on the History Channel.